WHEN The Straits Times met Ms Eunice Ng, she was immaculately groomed, but she often gets her hands dirty to catch fish at fish farms for her bespoke aquarium business, UrbanSeas. It is a sacrifice that is necessary in a small company with just four other staff: one administrative manager, two technicians and a designer. But her hands-on approach wins her respect in the male-dominated fish retail industry. 'Sometimes people might think a young female entrepreneur like me might not be able to handle this business, so it is up to me to prove that I can,' declared the 29-year-old creative director and owner of UrbanSeas. She set up the company in 2010. It designs aquariums to suit the individual requirements of clients, for both homes and offices. UrbanSeas' sales figures grew 64 per cent to $430,000 last year, and the firm is now profitable. Ms Ng, an interior design enthusiast, said she started the company to add a splash of life to Singapore's 'asphalt jungle'. 'When I visited show- flats, I felt there was too much glass and concrete and it felt a little cold and empty. So I thought, why not bring a green aspect into homes?' she said. Before she started the business, she took up a course in communications design at Singapore Institute of Management-RMIT to hone her design skills. She also borrowed start-up capital of about $100,000 from family and friends to get herself a showroom at China Square Central. Her design concept includes integrating individual pieces of furniture with the aquariums themselves. An example is an aquarium set within a bar counter, which is one of UrbanSeas' most popular pieces. Ms Ng also worked on reducing one hassle associated with owning an aquarium - changing the water. The water in UrbanSeas' aquariums needs to be changed only once every six months. Aquarium owners usually have to change the water in their tanks weekly because fish waste produces toxic ammonia which can kill the fish. But UrbanSeas' aquatic plants have special bacteria on them that break down the ammonia into nitrates. These then act as fertilisers for the plants. 'It's a solution that isn't just environmentally friendly but also friendly on the pocket. Changing water every week adds so much to PUB bills and is even worse when water resources here are limited,' Ms Ng said. The science is not new, but she has been working on improving the mix of bacteria since the beginning of UrbanSeas. The bespoke designs and the bacteria do not come cheap, she admits. One tank, which she calls 'the cube' and is designed as a coffee table, costs about $3,000. It takes about a month from the time of the customer's order to the finished product. 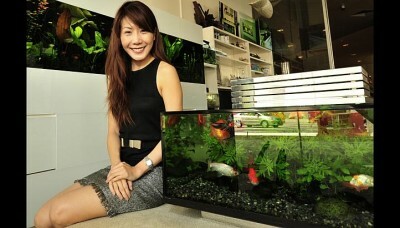 Ms Ng justifies the cost based on how she tailors each aquarium to her customers' needs. She customises designs based on input from each customer and her visits to the home or office. She pays much attention to the fish and aquatic plants, selecting the most aesthetically pleasing combinations. 'I think female entrepreneurs can give the softer and finer touch to their businesses. They place more emphasis on the design and beauty aspect of businesses,' she said. The business is just two years old and she is already well on her way to achieving that goal.